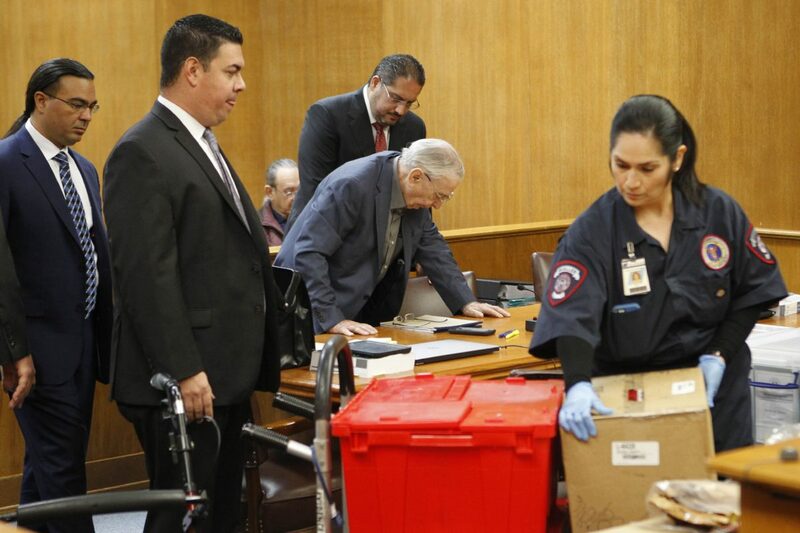 John Bernard Feit enters the 92nd state District Court as evidence in the 1960 murder of Irene Garza is brought into the court room by the McAllen Police Department Friday, December 1, 2017 at the Hidalgo County Courthouse in Edinburg. After Hollingsworth’s testimony, the state called three more witnesses before wrapping up for the day. Kenneth Crawford, a retired forensic document examiner, and Steven Robertson, a DPS crime lab tech, testified to their analysis of evidence submitted in the case. 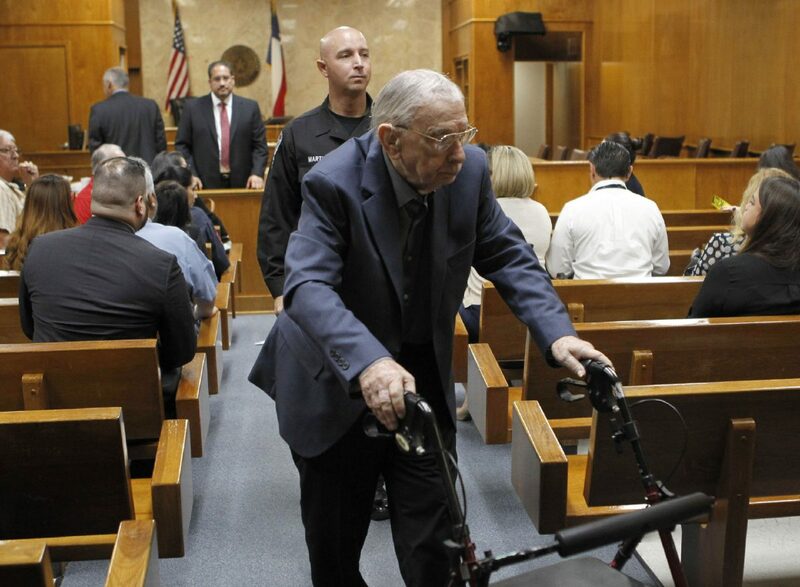 John Bernard Feit exits the 92nd state District Court during a break for lunch in his trial for the murder of Irene Garza Friday, Dec. 1, 2017, at the Hidalgo County Courthouse in Edinburg. Hidalgo County Assistant District Attorney Michael Garza holds up a letter signed by John Bernard Feit as it is unpacked from evidence containers in the 92nd state District Court Friday, Dec. 1, 2017 at the Hidalgo County Courthouse in Edinburg. 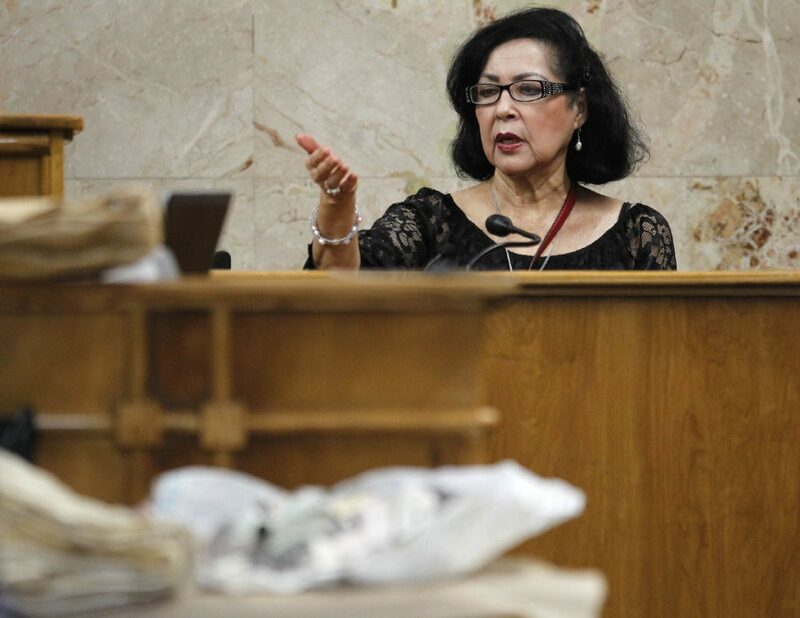 Beatrice Castro Garcia testifies during John Bernard Feit's trial for the 1960 murder of Irene Garza in the 92nd state District Court Friday, Dec. 1, 2017, at the Hidalgo County Courthouse in Edinburg. Garcia testified that Feit asked her to take photos of her in a cemetery as he passed by in a vehicle in 1960. Crawford, who was able to conclude Feit’s handwriting matched some of the documents he reviewed. Robertson’s testimony revolved around the hair and plaster casts he was asked to look through. Both experts were on the stand for a short time as the defense did not cross-examine them for long, only asking each a few questions. The day’s testimony ended after the state called its last witness of the shortened week, Jose D. Garcia, who was a fellow student with Feit in a Pan Am College class. He said it was sometime in April 1960 when Garcia noticed what appeared to be fingernail scratches on Feit’s right hand. Garcia said the news reports about the police interviewing a priest in Garza’s death and the scratches made him suspicious, but he never went to law enforcement with the information. The witness said he was busy with moving plans and that someone else had already come forward with similar information, and felt his account would be more of the same. The court recessed early and will resume for the third day of testimony Monday morning. The judge returned from his chambers and decided to overrule the defense’s objection to Hollingsworth’s testimony. The jury then returned to the courtroom and heard from Hollingsworth, who said Garza was worried about going to confession during Holy Week after the priest, who the witness identified as Feit, made Garza confess in the rectory. The court is deciding whether to admit the testimony of Ana Maria Hollingsworth, which is related to a conversation she had with the victim days before she went missing. Hollingsworth, who testified in specific detail about the time Garza visited her home, said the beauty queen felt “confused” about a young new priest who made the victim confess in the rectory instead of in the confessional. The defense argued against her testimony, which took place out of the presence of jurors, based on hearsay. The state is trying to establish Garza’s state of mind leading up to her disappearance through Hollingsworth’s testimony. The court is currently is taking this issue up in chambers. After more boxes of evidence were opened following the first break, the evidence tech remained on the stand and fielded questions from the defense. Handwritten letters from Feit to McAllen Police Chief Clint Mussey and an affidavit from the defendant taken shortly after Garza’s disappearance were among the items entered as evidence. Before the court recessed for lunch break, jurors heard from an employee of Sacred Heart church in Edinburg, Cleotilde “Tilly” Sanchez. Sanchez, the state’s third witness of the day, worked as a cook in the rectory at the church. Despite the caller not identifying himself, Sanchez said she recognized Feit’s voice. She said she often encountered him at the church’s rectory, where he spent time with other priests. Although not part of her testimony Friday, Sanchez has claimed that the threatening call from Feit came shortly after the Guerra incident, in which Feit’s finger was allegedly injured. This testimony followed Beatrice Garcia, who testified that a man approached her in his car as she walked in downtown McAllen, near the Sacred Heart Church, and told her that he’d love to take pictures of her by the cemetery. Garcia, who was in her 20s in 1960, said she felt scared by the proposition and later learned it was Feit, who had been implicated in the Guerra incident. After the encounter, Garcia said her father would accompany her when she walked to work. Prior to the start of testimony, the defense objected about the evidence in the possession of McAllen police, specifically all that a crime scene technician recovered. During the first hour of testimony, the state called to the stand Monica Ballesteros, a crime scene technician with nearly 10 years of experience at the McAllen Police Department. She opened packages containing the nearly 60-year-old pieces of evidence recovered from law enforcement back in 1960. Specifically, the state showed jurors the items of clothing Garza was wearing when she was pulled out of the canal on April 21, 1960. The items included a petticoat, a blouse, one shoe, a belt, and the black purse found days before her body was discovered. 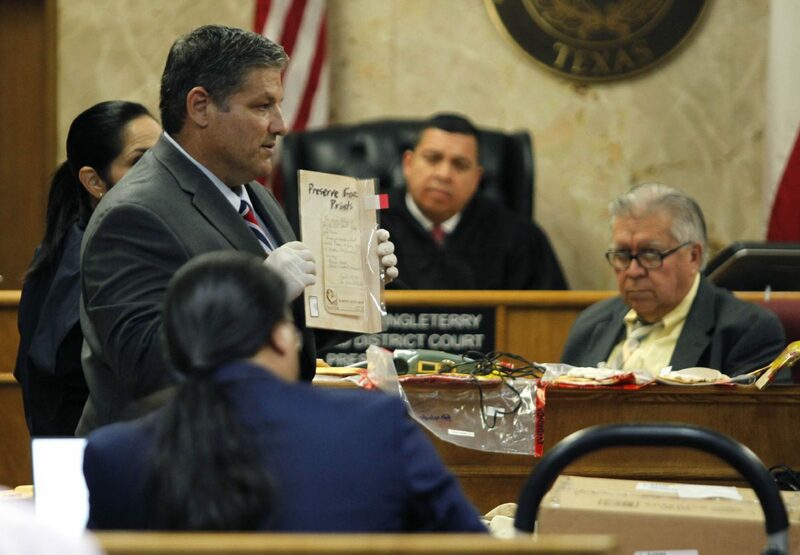 The purse was brought up during the trial’s first day of testimony, when Juan Gonzalez, a former student of Garza’s, and Alfredo Barrera, an Edinburg schoolteacher and family friend, each said they found the purse on different days. The defense objected to the evidence’s admittance prior to the start of the testimony, arguing its chain of custody. But the court overruled that motion and the evidence was entered into the record. Day 2 of the long-awaited John Feit murder trial is underway. On Thursday, a reporter-turned-attorney testified that Feit, the ex-priest accused of suffocating schoolteacher and beauty queen Irene Garza in April 1960, remained free for more than half a century thanks to a coverup brokered by two of the region’s more influential institutions at that time. The reporter, Darrell Davis, a former Channel 5 reporter who covered the case in 1960, testified the Hidalgo County district attorney at the time invited local media to an off-the-record meeting in which he informed reporters that Feit would plead no contest in the America Guerra attack and the state would drop the Garza case.